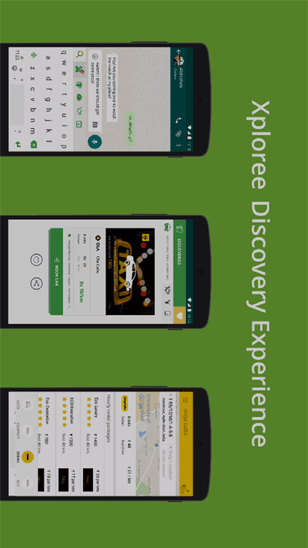 Xploree Keyboard for Android Phones, Smart Keyboard App - Download Now! Xploree understands your interest and offers one click access to latest trends, news, live cricket scores, music, travel, services and deals on the fly. Type in more than 150 languages including 28 indic languages. Customize your language options to Assamenglish, Banglish, Hinglish and more. Maintain your personal dictionary and avoid typing extra by saving text short cuts in the keyboard. Get the superpower of multiple apps on the mobile keyboard. Shop, Book & Order without having to switch apps. Hit search directly from the keyboard, in browser and the chat apps, without having to download or launch individual apps. Personalize your keyboard with emoticons, themes, stickers and a one-time log-in that saves all your preferences. Harness the inherent power of mobile keyboard by leveraging user behavior. Flag your products and solutions at the time of consumer’s momentary need. Keyboard is the new branding vehicle that will give the much-needed visibility and recall to your brand. Built for developers, device manufactures, IoT players, Xploree's technology platform can be readily leveraged as IoT, bots, smart voice assistants and can be deployed across all operating systems and devices. I loved it. A standard keyboard that delivers best of what it gives. I really like it. It's quality is very good and easy to use.